It has been said that the discovery of oil in Oklahoma was accidental when a driller searching for salt water came up with “black gold” instead. It wasn’t until April 15, 1897 that the first commercial oil well, the Nellie Johnstone #1, was drilled near Bartlesville, some 38 years after the first commercial oil well in the U.S. was drilled near Titusville, Pennsylvania in 1859. Since the first commercial well was drilled and word of its success spread, oil men and companies flocked to Oklahoma to set up shop and claim some of the “liquid gold” from the huge underground oil pools. Oil production in Oklahoma grew rapidly as new oil field discoveries were made. Oklahoma oil production increased from just 1,000 barrels a year to 43.5 million barrels in a year within a ten-year period. In 1907, the discovery of the Glenn Pool oil field played a major role in increasing state production. The Oklahoma City Field was opened in 1928 and would soon become one of the nation’s largest producing oil fields. The Mary Sudik No. 1 oil well began drilling in the Oklahoma City Field shortly after the field opened. The Mary Sudik No. 1 would soon become known as the “Wild Mary Sudik” gusher, spraying an estimated 3,000 barrels of oil for 11 days. The total worth of the oil from the blowout would be worth around $86 million dollars in today’s market. After capping the blowout, Mary Sudik No. 1 became the most productive oil well in the world in 1930. 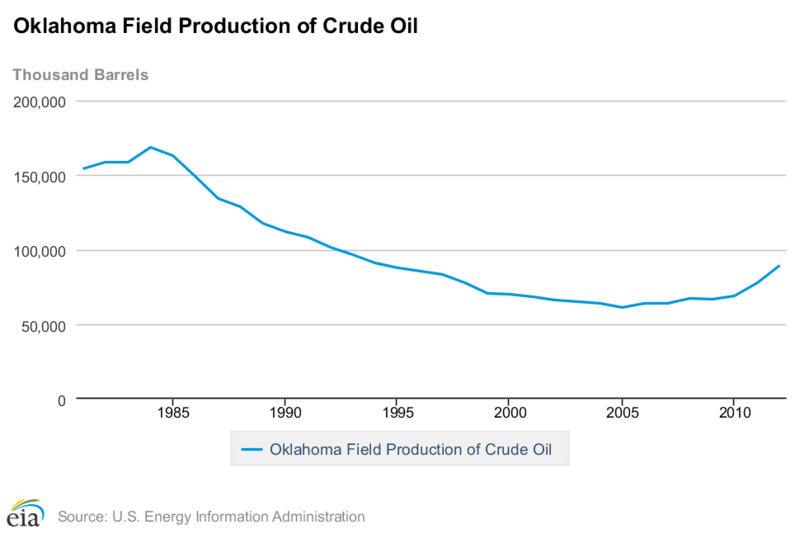 By the late 1960s, oil production in Oklahoma and across the United States began to decline. According to the Oklahoma Corporation Commission, Oklahoma’s 115,000 oil wells produced 76,803,714 barrels of crude oil in 2011. The state produces a substantial amount of U.S. oil, and in recent years, accounts for more than three percent of total U.S. production. The first significant natural gas field in Oklahoma was the Kinta Gas Field in Haskell County in 1916. Peak production occurred many years late in 1971 at 450 million cubic feet per day. In 1918, the Oklahoma part of the Hugoton Gas Field, the largest in North America, was discovered in Texas County. Ultimate recovery for this field is estimated at 70 trillion cubic feet. The next significant gas field discovery was the Wilburton Gas Field in Pushmatoha County in 1929. This field has produced over two trillion cubic feet of natural gas to date. State gas production peaked in 1990 at 6.2 billion cubic feet per day. American natural gas supply leveled off as existing natural gas plays began to mature. Now with the discoveries of new shale plays, natural gas drilling in Oklahoma and across the U.S. hasn’t been higher. Production rates in Oklahoma over the past two years look similar to production in 1989 and 1990. In both periods, the demand for natural gas increased as oil prices began to climb. Oklahoma is home to more than 12 of the nation’s 100 largest gas fields. It’s one the nation’s top five natural gas producers, flowing approximately 180,000 million cubic feet of natural gas per month in recent months. 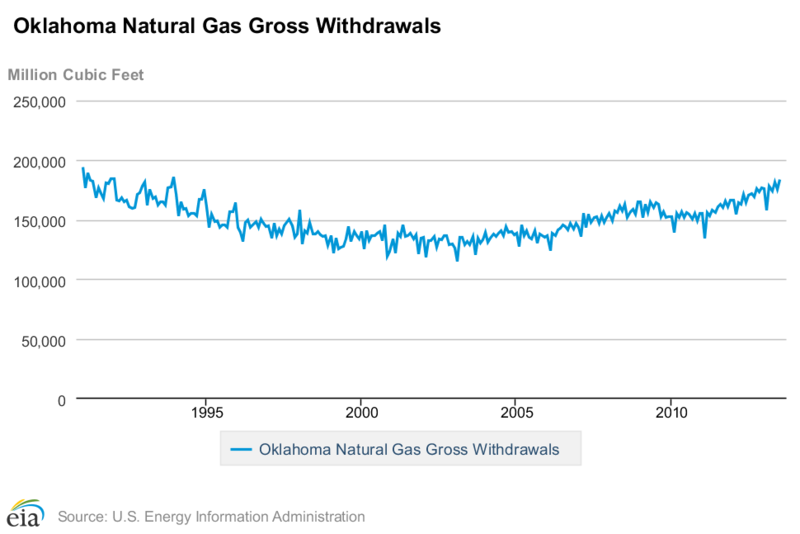 According to data from the U.S. Energy Information Administration, Oklahoma’s natural gas marketed production rate was over 183,000 million cubic feet in July 2013, making it the highest rate of natural gas production in July since 1990.